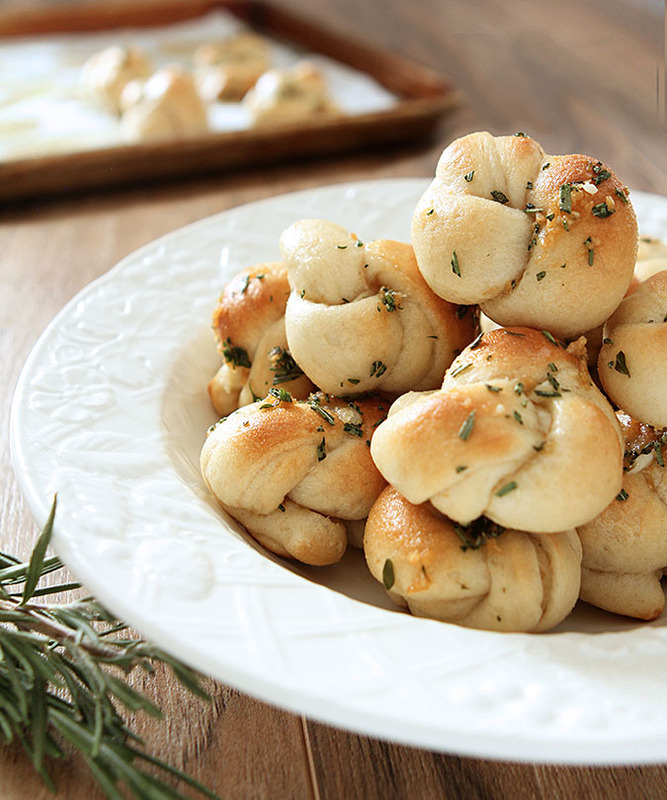 There are times when shortcuts are so valuable and the one I use for these Easy Brown Butter and Herb Garlic Knots fits that bill perfectly. 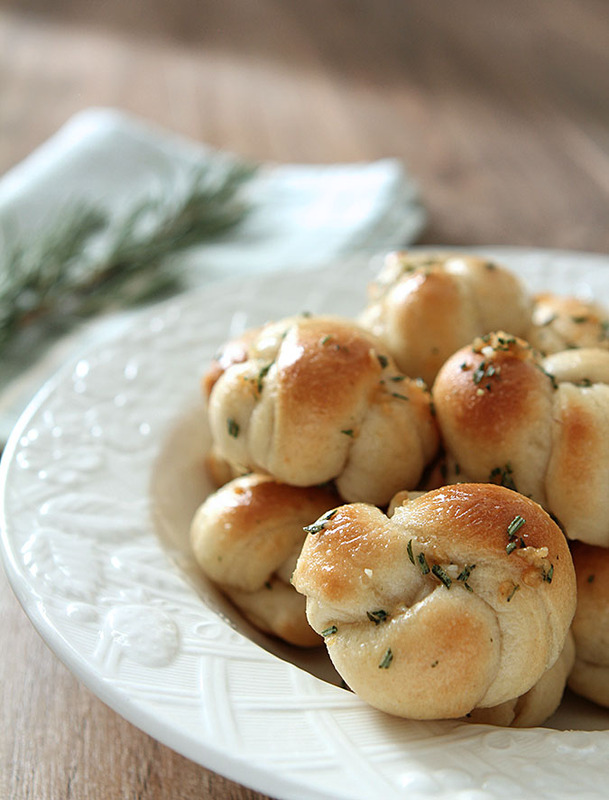 They’re both easy and so yummy too! I made my Thanksgiving dinner early this year knowing I wouldn’t be cooking at my home for the holiday; it was fun to have the time to cook and photograph some of my favorites to share with readers here. That’s something I’ve never done before because I usually share what we will actually be eating and while a pie or casserole might have a slice removed from it when it’s served, I’ve simply never taken great photos of dishes on Thanksgiving when the hordes are standing at your back and hungry and wondering WHY??? you have to remove something for just a moment to get a quick snap. Want to see the fruits of that labor? I’ve included links to all of the dishes in this post for last Friday’s cocktail. Go on…go take a peek at the only turkey I will ever make (maple and bacon is why), homemade green bean casserole from scratch, easy and delicious roasted carrots and a fantastic bourbon and toasted walnut pumpkin pie. So good I sort of wish I was doing it all again! So that meant leftovers were early too. Last weekend I had invited some friends and their kids over to share a favorite, my own version of a ‘Friendsgiving’ and realized I had no bread to serve with a pasta dish. What to do? Well we would have survived but as luck would have it, that same day my friend Jessica from the blog How Sweet It is posted a recipe for Brown Butter and Herb Garlic Knots and all she had to do was say, ” If you’re short on time, you can use a store-bought dough and add the brown butter and herbs which would take it over the top and make it taste not-so-store bought.” I would qualify short on time as people showing up in an hour right? I had the cans of pizza dough that are usually reserved for me and girlfriends if we get the craving for a quick pizza but it seems now they were destined for great things. Things like brown butter and garlic and yes, fresh herbs still alive in my snow covered garden pots. YAY! Were they a hit? Well, I sort of love this kid story. Three kids ages 6 and 7 who were set up in the family room picnic style went from, “What is the green stuff?”, “That one is too brown on the bottom?”, “Do we have to?” to a tale of five adults at the table and little arms appearing and reaching for more and running away. The adults started to get just a bit testy about their quick disappearance, you know as in…WAIT…we want some too! I’m sure I can say with conviction that Jessica’s version is superior, what with homemade dough filled with some more herbs. But this version is quick as can be; cut, tied and topped with the same amazing butter using herbs I had available and best of all done in 20 minutes. Yes, sometimes that is my kind of perfect! Added bonus? I served them again a couple of days ago when my neighbor Amy and I were canning jars of salsa and we weren’t finished by dinner time. I put on some pasta, she commandeered some leftover venison spaghetti sauce from her fridge and her son Lee, who is 6, helped me tie the knots. Talk about easy? They are kid easy! Thanks Jessica; I really want to try your version but I have to say…these were just perfect in a pinch! Remove the dough from the package and lay flat on flour dusted counter. Roll out to measure 9" X 15"
Use a pizza cutter or knife and cut into approximately 24 pieces. Roll into a cylinder and tie each piece into a simple overhead knot; tuck the ends under the knot. Bake for 12-15 minutes or until just golden brown. 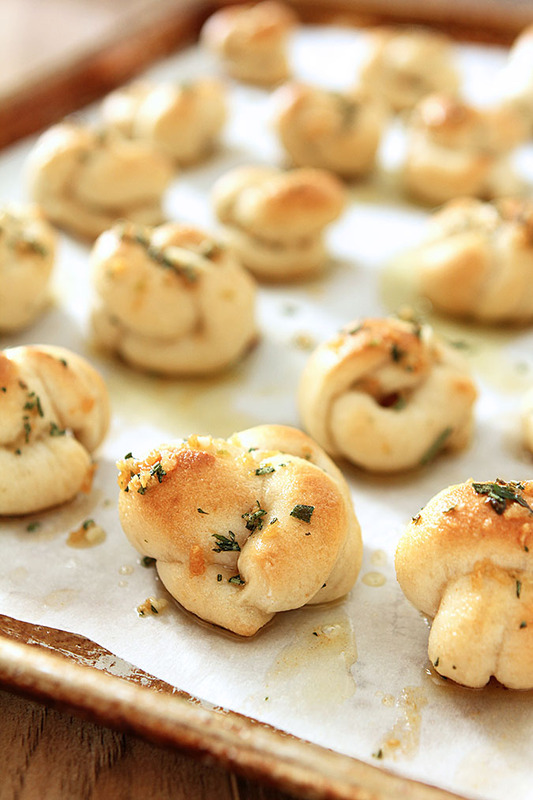 Remove from the oven and slather with the herbed garlic butter. Best served warm the same day but who are we kidding? there won't be any leftovers! Here's how I cut mine. I originally made these and we just tied them in a single knot; they looked more like a bowtie but with the pizza dough not rising again, those ends that stuck out were a bit thin and tended to brown a bit too much. Solution was easy, peasy...just tie in the simple bow and tuck the ends under the knot. Perfect! Pretty! And tasty! Not to mention quick and easy. Fun stuff — thanks. No, you are! XOXO back at ya. We don’t have canned dough here, but I can buy ready-made fresh pizza dough in a bag at the supermarket (or I could just make it myself, I guess) so I’m looking forward to giving these a go. Might have to practice a bit with the knot, I suspect. Yes, any ready made pizza dough would be good. The knot is so easy, just loop it once and tuck the ends under. Done!